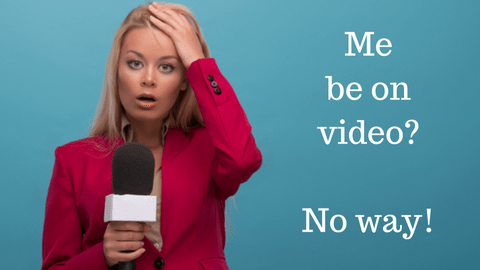 … is the biggest excuse I hear from people who avoid using video as part of their business marketing. Lets deal with the first one first. When you watch yourself on camera for the first time, you’re experiencing yourself like you’ve never experienced yourself before – exactly how you look and sound! Eh? Let me explain… Unless you are prone to out of body experiences, the only way to see yourself moving around is in a reflection… Looking in a mirror, in a puddle, in the reflection of a shop window, so the image of you you’re most comfortable with is your reflection. That means, when you see yourself in video for the first time (not as a reflection), the immediate response is “that’s not me”. But it is you and it is exactly how everyone else who knows (and loves) you, sees you. What about how you sound on video? We all hear when our ear drum vibrates, but there are two ways to get it vibrating. You hear your voice through your skull, and as the sound travels through your bones they spread out and lower in pitch, giving you a false sense of bass. When you hear your voice on video, it sounds higher and unfamiliar to you. So when you first watch yourself on video you are seeing and hearing yourself as everyone else sees and hears you, but not how you have ever experienced yourself before. This “new” you is going to take a little time to get used to. But this is no excuse to avoid making videos. Or maybe, I just hadn’t had enough time to learn how to play it properly and practice. This is true of every new thing we try… It is unlikely that we will be great at it at our first attempt. But this is no excuse to avoid making videos. You need to practice, get a great teacher, coach, mentor, trainer, director and let me help you though those early uncomfortable moments and support you in becoming confident in front of camera. And just to let you know, in the nearly 30 years I’ve been working in television and video production, there’s not been a single person who I haven’t managed to get over their initial fear and helped them look great. Yes… When I first saw myself on video I didn’t like the way I looked or sounded. I also had to get over seeing my disability which was tough… But do you know what got me through? When you talk with passion and enthusiasm the camera loves you, and all those doubts and worries about how you look and sound disappear. Which I talk about in this video below. So come on… No more excuses, no more avoiding doing what I know you want to do. Just give it a go, get yourself started, practice and get a mentor / director to help you in your journey. This is really useful and helpful. Your right, we are what we are so accept it and move on. We are all beautiful. Thank you for this, it’s inspired me!! My pleasure Gillian, I have also found that when I talk from my passion and my heart it doesn’t matter what I look like (or to be honest what I say), a connection is made between me and the person watching my video.